Cub Scout Pack 115 is collecting clothing and small household goods to recycle and raise money for their spring camp-out. They will be doing a caravan of cars/vans/trucks for delivery and will be collecting in the Detroit parking lot at the front of the church. Church members are also welcome to drop their bagged/boxed and marked items (“Cub Scouts”) in the Hook Music room the week prior to the event. 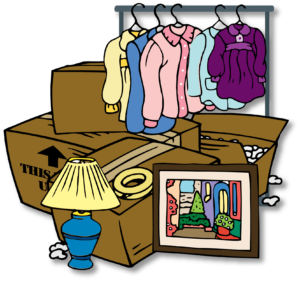 Please keep us in mind as you clear out your closets in the new year! Contact Rebecca Shaw if you have questions. WHY: Recycle and help the Cub Scouts earn money for camping! HOW: Drop off usable clothing, shoes, belts, etc. in plastic bags; small household goods (toys, games, CDs, books, dishes, etc.) in boxes please! Five youth have been delving into what it means to be a Presbyterian as they make the choice to commit to this church. On May 5, there will be a short ceremony within the worship service welcoming those who choose to be confirmed into the Lakewood Presbyterian Church family. Please join us for this blessed occasion. The youth are preparing for their annual Youth Sunday on May 19. This year, the service will highlight what the youth have been learning about their faith during confirmation classes. They will be tackling questions that many of us have asked, including: “Who is God?” and “Why do we worship?” As they share their faith and prepare to make a commitment to the church, they will also offer an opportunity for others to commit themselves to Christ who have not already done so. Youth Sunday is a wonderful way for the youth to learn about the different parts of a worship service and leadership within the church. They are responsible for developing the sermon, choosing music and scriptures, and implementing the service. Join us on May 19 and be blessed by the talent within our church.